I always struggled with a Roman view on judgement which concealed the original Hebrew meaning of this word. This Hebrew word, one of the most important keywords of the bible, means doing right, doing good. – righteousness in vindication or salvation etc. 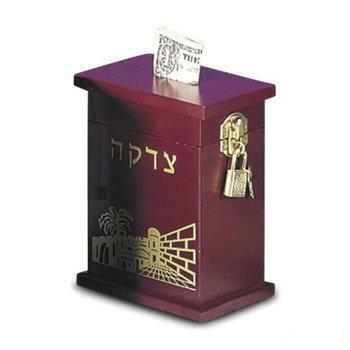 In a synagogue you probably will find a box to put money in, with the word Tzedakah on it. In fact that has nothing to do with money, but it has to do with charity. It is a way of doing something righteous. But what is righteousness then? That’s what we have to do. It’s all based on the very first commandment: Love your God and your neighbour. And what is the righteousness of God? Here often a western understanding goes biased. Here often is handled the Roman rule of just: We have a law and those who act against it are to be punished. That definitely doesn’t fit the meaning of Tzedakah. Tzedakah goes far beyond that. When Tzedakah comes from heaven it is always intertwined with merci, goodness, kindness, compassion. And not only that. G-d is not only righteous because he prefers good or even because he punished evil, he is essentially righteous because he comes to the aid of those who are suffering, who have no hope if he does not deliver them. G-d’s righteousness cannot be separated from his saving activity. Salvation (Yeshua in Hebrew) is in the meaning of Tzedakah. Tzedakah is often related with justice or judgement. The judgement of the righteousness. It is also several times translated as justice. (15x in the KJV, 128x as righteousness) But the Hebrew word for judgement is different, it is Mishpat. When G-d is to judge people in showing his righteousness, it always has in it that G-d wants to deliver the poor and the weak. That is the first thing we have to keep in mind. And when we do not listen and repent, then there’s punishment. See psalm 36:6: Thy righteousness is like the great mountains; thy judgments are a great deep: O LORD, thou preservest man and beast. There is not stated “to punish”, but “to preserve”. And that is what I would like to say. G-d’s righteousness and judgement is not to eleminate humanity, but to establish it. A Tsedek is a person who fullfil the Law/Torah. And the Torah is based on Love. And therefore the judgement (Mishpat) of a tsedek is never without Love. Another attempt is made to reach a better human life. Karen Armstrong is launching a project together with the main world religions. After A common Word from Muslims, now a new voice is heard, Charter for Compassion, calling to have compassion to other people. It states: The principle of compassion lies at the heart of all religious, ethical and spiritual traditions, calling us always to treat all others as we wish to be treated ourselves. That sounds very familar! Hopefully many would render this practice, and would be drawn closer to Yeshua, the great Example. The One we are in need of. I think his Word of Life is still penetrating global humanity before the Sjofar sounds.